We knew this new era of Star Wars would be different, but we now have confirmation that these films will be unique for one major reason: for the first time in the franchise’s history, the Star Wars films will not be based on original ideas by George Lucas. 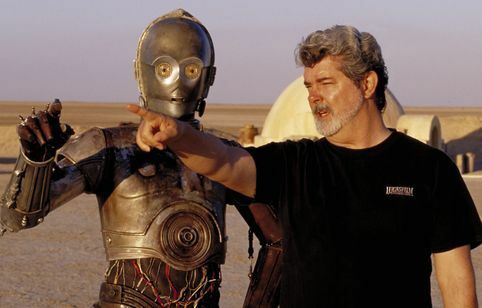 When Lucas sold his company, Lucasfilm, to Disney along with the rights to one of the most significant franchises of all time, Lucas was to remain involved in the new films as a consultant. Kathleen Kennedy was spearheading these new films as the producer, but it was made clear that Lucas was handing over all of his story treatments and ideas for the continuing saga, specifically installments 7, 8, and 9 which he’d been touting for decades. However, Lucas now says two years later that, somewhat unsurprisingly, none of his treatments are being used for the new Star Wars films. More after the jump, and click here to watch Perri’s own recent interview with Lucas. Now, this isn’t altogether surprising. Shortly after the sale to Disney, it was announced that Michael Arndt (Toy Story 3) had been hired to pen the screenplay for the then-untitled Star Wars: Episode VII. We subsequently learned that Arndt had actually been working on the screenplay since before Lucas sold his company to Disney, fleshing out a treatment originally conceived by Lucas himself. When J.J. Abrams was hired on as the director, he and Arndt worked extensively on the script for a year. Then, somewhat abruptly, Arndt was removed from the project and Abrams took over screenwriting duties himself with Lawrence Kasdan acting as co-writers. Apparently Abrams and Arndt didn’t see eye-to-eye on how to proceed with this first installment in a new Star Wars trilogy, with Arndt wanting to focus on new characters and Abrams wanting to beef up the roles of the Original Trilogy actors (ie. Harrison Ford, Mark Hamill, and Carrie Fisher) and make them a more central part of the story. With Lucas’ recent comments, it seems pretty clear that Arndt and Abrams were working from a story that was originally put together by Lucas in his treatment for Episode VII, but Abrams and Kennedy (and possibly Rian Johnson, who’s writing Episodes 8 and 9) subsequently decided they had come up with a better, different take altogether. This is certainly interesting and, again, significant. Lucas admitted years ago that he wouldn’t have much to do with the new Star Wars films, but now we know that these will be the first Star Wars films in history that are essentially devoid of Lucas’ creative input—for better or worse.